History of the McDougald Beaver House now The Beaver House Restaurant in Statesboro, Ga. National Register of Historic Places. My great-grandfather John Alexander McDougald built this house in 1911. At the time, Main Street was lined with comparable homes built from the windfalls of Sea Island Cotton and other agricultural success stories of Bulloch County around the turn of the century. John was elected mayor of Statesboro during this time and our house was used to entertain friends, relatives and business associates. My great-grandmother played her baby grand piano for guests, which my daughter still pecks on today. Mayor John Alexander McDougald was Dougald McDougald's son. Scan of postcard dated June 1912 to Mrs. R. Lee Bethune, Raeford, NC, from the mayor: "Dear Mattie, Why don't you write us Everyone of you owe me a letter Hope you & Lee are well. My folks & the kin are well. Your Loving Bro John"
JOHN ALEXANDER MCDOUGALD (Source: (1) J.A. McDougald, Sworn statement of Mayor John A. McDougald, (Dec. 12, 1911), The City of Statesboro, F.N. Grimes, Recorder, Statesboro, Ga.Georgia - Bulloch Co. I do solemnly swear that I will well and truly demean myself, as Mayor of the City of Statesboro, for the insuing term, and that I will faithfully inforce the charter and ordinance of said City to the best of my skill and knowledge; so help me God. Sworn to and subscribed before me this the 12th day of Dec. 1911.ED Holland [signed]NR & J.P. BC Ga. [sic] JA McDougald [signed]., (2) 1900 Emanuel Co., GA census, (1900), McDougal, John A., head of household, race W, gender M, b. June 1864, age 35, married 15 yrs., b. NC, father b. Scotland, mother b. NC, occupation naval stores merchant. Mary "Mamie" Hall, third wife of Dougald McDougald & sister of his second wife, Mattie Hall. 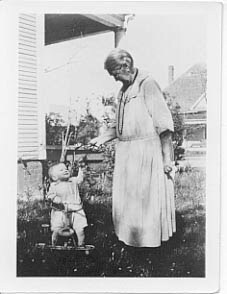 The child is John Temmons Baxley, Jr., Mattie's great-grandchild. Photo taken at Mayor John McDougald's home in Statesboro, GA. around 1929. 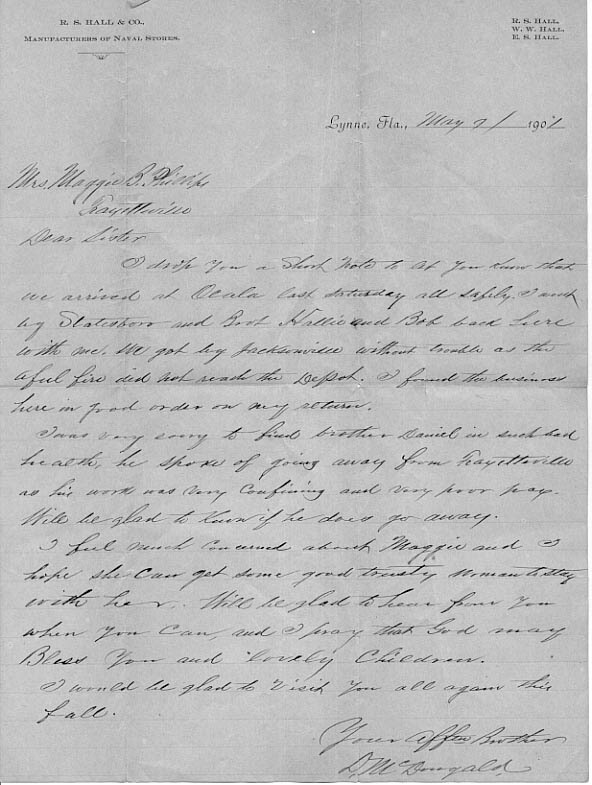 Scan of original letter dated May 7, 1901 from Dougald McDougald to his sister, Maggie B. Phillips. DOUGALD2 MCDOUGALD (WILLIAM ALEXANDER1 MCDOUGALL) (Source: Michael McDougald, Correspondence from Michael McDougald, "... a remark on something I learned from an old church bulletin in North Carolina. Dougald was apparently a major in the Civil War fighting, of course, for the South. He must have been a large landowner for it gave the quote: 'Dougald had about 100 slaves.' ... Dougald apparently lost everything in the Civil War, but came back and started over and built up another fortune and lost it in a bad investment competing with the railroad. I then made the assumption that he might have been broke and old and told his three sons, 'Let's go to Southeast Georgia and get into something we know.' Turpentine, Pine trees. Naval stores. Within a few years of coming south you can see the accomplishments of son John Alexander who became mayor, built the big house and became a community benefactor. He was a large landholder with extensive turpentine stills and farms.") was born July 05, 1832 in Leargybreack, Isle of Jura, Scotland, and died March 15, 1904 in Statesboro, GA.
Pamela Klarpe or Permella Klarp, wife of Mayor John Alexander McDougald, of Statesboro, Ga. Referred to her as "Mama T."
"The Church at 112 Broad Street"
Mt. Zion, the first Presbyterian Church in Bulloch County, was dissolved in 1895 when many of its members relocated. However, a new church was organized in February of 1896 as Statesboro Presbyterian Church. Five new members (Mr. and Mrs. John McDougald, D.C. and Maggie McDougald) joined the 13 members remaining from the Mt. Zion church as charter members of the new church. Just 13 months later, the congregation moved into their new building on Broad Street. In 1898, six of those members who also had been members of the Mt. Zion Church, relocated to Daisy, Georgia. It is believed that, again, they took their church with them and possibly organized a Presbyterian Church at Daisy. Statesboro Presbyterian Church was located on Broad Street. Statesboro was growing steadily, and although the church at first in 1897 was at the edge of town, town soon was building eastward surrounding the church. The lot had been donated by Mr. W.C. Parker, a member of the Baptist Church. It was not a large lot, and in the 30's a house was very close on the north side of the building. There was an open field on the south side. There were pecan trees on this lot which provided shade for the member's horses. One member, Col. Albert Deal, continued to ride his horse to services long after automobiles filled the streets. The Naval Stores industry continued to have influence on the church for some time. This business opportunity had brought a number of people from North Carolina to the area. One of whom was John McDougald who arrived about 1888. He first worked for a company called Williams and Outland as a woods-rider. Then he teamed up with Outland to establish several turpentine stills. One of those stills was the site of the first field experiment of new rosin gathering methods (1901) by Charles Herty. The result of Herty's experiments provided a way to gather the rosin without destroying the trees, and this revolutionized the Naval Stores industry. The McDougald-Outland distillery was located about where Hanner Gymnasium on the University Campus is now. Mr. John McDougald was a charter member of Statesboro Presbyterian Church and became a very prominent citizen of Bulloch County, even serving as Mayor of Statesboro. He was a very devout Presbyterian, and set a fine example for his descendants to follow--and they have done so. There are very few people still living who attended the Church on Broad Street. Brothers Worth McDougald (retired and living in Athens) and Don McDougald (retired and living in Montreat) grandsons of John McDougald, attended the Broad Street church as boys in the 30's. Their memories of the wooden frame building are bright and clear and they share them with us. Worth describes the building as 'dark' - dark woodwork, dark floors, dark pews-one big window on the front of the church, smaller windows on the sides, colored glass in the windows. Seating for about 100-125 people. Three sections of pews with two aisles. An addition at the rear of the structure had about eight very tiny classrooms. To reach the Sunday School rooms, one entered the front door of the church - went past the pulpit on the left side and out a door, walked on a covered walkway to reach the classrooms, which all opened to the outside. There was nothing elaborate about the building and the classrooms were sparsely furnished. In cold weather, the building was heated by a wood stove. The teen-age boys tended the stove and brought in the wood. Don remembers one time when the fire got out and set fire to the floor. The boys ran outside and gathered up hands-full of sand from the unpaved street and ran back inside to throw the sand on the fire to put it out. Don remembers his father, W.E McDougald, talking about the finances of the church. There was very little money in the 30's during the depression. In about 1927, the church had borrowed $1000 at 6% interest. The collections were so small in the 30's that they could afford to pay only the yearly interest of $60. When the church burned in 1940, they still owed that $1000. Both Worth and Don have vivid memories of the church members of those days. They both remember Miss Irene Arden who taught Sunday School. They said that her class room was the only one that was bright and colorful, with pictures and flowers decorating the room. They even remember exactly where she lived, and that she drove an old Model T Ford car to church and always parked it in the same place. Worth remembers that Miss Irene had a lovely operatic singing voice which reached well beyond the church walls when she sang with the choir. Worth remembers that Colonel Albert Deal always sat in the same pew (on the right side near the back) and that he was often called upon to pray. His prayers were long, with petitions for every person and every cause. Being a lawyer, he chose his words carefully and there were sometimes long pauses in his prayers as he considered what he should say to the Lord. The boys sometimes thought he had fallen asleep - but he always continued. In 1920, the congregation felt the need for more space and they purchased a lot on the corner of Zetterower and Savannah Avenues, and proceeded to build a manse for their minister, Rev. E. J. Hertwig. However, Mr. Hertwig died very suddenly in April of 1921. His untimely death was a great shock to the congregation and plans for a new church next to the newly constructed manse were abandoned. Worth remembers that the congregation was small in number and very clannish (probably the Scots heritage?) He described the building as gaunt and needing a coat of paint during those depression days of the 1930's. Don remembers several weddings during the 30's: Bernard and Sydney McDougald and Ruth and Roy Beaver among them. Then, disaster struck in 1940 when the building was hit by lightning and burned. Members tried to save what they could, but the building was a total loss for them. So the lot was sold and a new brick church was constructed on the Savannah Avenue Lot purchased 20 years before. Worth feels that this was a turning point for the church in several ways. In the new building the church became more open and welcoming. Hew people came in, many from the college, and had a great influence on the life of the church. Nothing remains of the old church, but a house was constructed on the foundation of the old building. You can see the place where the Presbyterians worshiped for over 40 years if you ride down Broad Street and look for #112. You can see a picture of the 'Church on Broad Street' on the wall in our library. For a complete history of our church, refer to 'A Century of Presbyterianism in Bulloch County' by Virginia Russell. Many, many thanks to Worth and Don McDougald, Virginia Russell's History of the Church, Statesboro Herald's 'Century of Progress; and 'Spirit of the People', and the Minutes of the Church on microfilm at Statesboro Regional Library for this information. The McDougald – Beaver Home is a large , turn-of-the-century, Neoclassical home set on a lot along a once-fashionable residential street in Statesboro. The McDougald – Beaver Home is two stories high and polygonal shaped. It features a large two-story front portico. Neoclassical detailing is extensive and includes one and tow story Corinthian columns, a second-floor balustrade porch, first-floor balustrade porch, and four fanlights. Clear, bevel-edged glass fills exterior doors and sidelights of the front entrance. Gabled- front portico has a roof ridge running from front to back. The two flanking rooms on the front of the house originally had hipped roofs, but were changed to flat roofs early in the house’s history. On the north and south sides of the house gabled roofs run from the center of the main roof ridge. The interior of the McDougald-Beaver Home features a spacious, centrally located stair and entry hall, polygonal and rectangular rooms, transom doorways, and generally open, free-flowing spaces. The central hall, living and dining rooms are elaborately detailed with Neoclassical wood and plasterwork, including fluted Ionic columns and pilasters and paneled wainscoting. Fireplaces and mantels are all different, but generally included a framed mirrored over-mantel and exposed glazed tiles. One fireplace has been modernized with old brick and another either walled over or torn out. The walls are for the most part smoothly plastered, the exceptions being the two remodeled rooms that were sheet rocked over and the 1950 addition that was walled with sheet rock. Beaded tongue-and groove boards are used on walls in the second story back (West) rooms. A large linteled entrance to living room from the central hall has been enclosed with French doors and transom. This was probably added in the 1930’s for conservation of heat. The structure retains its original pine ceilings and floors. The stairway is ell shaped and features a bench at the base of the landing. Wainscoting follows the stairway up, and is balustrade at its upper and lower landings. Dentil and egg –and-dart moldings trim newel posts and bench. Bathrooms are all remodeled and do not reflect the period in which the home was built. The rear of the McDougald-Beaver Home is flush with a fanlight in the gable. First and second story back porches were enclosed around the 1930’s. The McDougald-Beaver Home is constructed with a balloon frame sheathed in cypress weatherboards. Foundations consist of hard, pressed brick. The roof is surfaced with channeled sheet metal. All lumber used in the house for structural and decorative purposes is heart pine. The pediment front portico is supported by two sets of large coupled Corinthian columns. A fanlight is set in the front pediment as swell as in the pediments on the North and South exposures. The McDougald-Beaver home is generally in good condition. The structure is sound and both the interior and exterior have been largely restored. Only the bathrooms and upstairs back rooms remain to be rehabilitated. During the 1940’s the house was subdivided into apartments, but the only partitions erected were in the upstairs rear of the house and only involve three rooms. These partitions are merely wood paneling and could be removed easily. The grounds of the McDougald-Beaver home retain little of the original turn-of-the-century landscaping. The front (East) yard consist of a broad, level lawn and a large old camphor tree. During the past 18 years underbrush and saplings have choked out all original plantings. The front walk, centered on the front door, is laid with polygonal paving blacks between stone curbs. A stone-and-iron fence once surrounded the front yard. Remains of this fence are evident as the foundation of the fence is still present and a few of the stone balusters are stored under the house. The south-side yard has a driveway giving access from South Main Street to the back (West) yard. The North-side yard remains an extension of the front yard. On the rear (West) yard a brick garage, and three storage sheds were built in the 1940’s and 50’s for storage purposes. Due to the fact that they were non-contributing to the McDougald-Beaver home’s significance and the fact that they were non-contributing to the McDougald-Beaver home’s significance and the fact that they were of poor construction and falling in, the out-buildings have been removed. During the 1940’s an asbestos shingled duplex was moved to the property and placed on the rear Southwest corner of the lot facing Walnut Street. Also, to the rear of the house and facing Walnut Street on the Northwest corner is a weatherboard rental house. The date of this house has not been determined, but it appears to have been constructed about the same time as the main house. The structure is thought to have been quarters for Lydia, the McDougald’s faithful servant. This house is presently rented. The surroundings of the McDougald-Beaver Home have changed considerably over the years. South Main Street at the turn of the century was a fashionable residential avenue with many fine houses and large landscaped lots. During the 1930’s many of these large houses were subdivided into apartments or hotels, as South Main Street was the main access to Florida from the North. After World War II, the street developed into a largely commercial corridor, with new office, restaurant and commercial buildings replacing many of the earlier residences. Today it remains a commercial area, although a few houses from the turn of the century have survived. Today the McDougald-Beaver home still stands as the most impressive, although it is bound on the North by Gulf Oil Service Station and on the South by Pizza Hut. The McDougald-Beaver home is significant to the architectural and local history of Statesboro, Georgia. In the former category, it is significant as one of the few remaining large wooden Neoclassical, turn-or-the-century homes. In local history it is significant as the home of John Alexander McDougald, a locally prominent farmer and businessman, and has remained in his family since it was built. The McDouglad-Beaver home is an exceptionally fine turn-of-the century Neoclassical house. Prominent features of its design include compact, regular massing, the front portico, colonnaded front porch with balustrade and interior organized around a central stair hall and period detailing ranging from the monumental Corinthian columns of the portico to tiny egg-and-dart molding around doors. What makes the McDouglad-Beaver home exceptional in terms of its design, is its size, range, scale, and elaborateness of its details, and the combination of formal, yet practical exterior arrangement of the deep front colonnaded porch, necessary for comfort in the deep South. Equally exceptional are the two sets of large coupled Corinthian columns, as coupled columns are not generally seen in Neo-classical architecture, according to Whiffen. The materials and craftsmanship of the McDougald-Beaver home are also exceptional. The principal building material in the house, used for structure, finish and detailing, is heart-pine wood. This strong, durable, dry, knot-free lumber was probably cut from Mr. McDougald’s own timberland, and it is found in the balloon frame, floors, wainscoting, interior columns, pilasters and ceilings. Cypress was ordered from New Orleans by Mr. McDougald for the weather-boarding. Another important construction material used in building the McDougald-Beaver home rests on a foundation of brick piers with lattice brick work between the piers. The four chimneys have recessed brick work and are thought to be the work of L. R. Blackburn, a local mason noted for his decorative work. Over and above its intrinsic architectural merits, the McDougald- Beaver home is significant as an exemplar of an important type of house in Georgia. Neoclassical houses were built in nearly every community and almost always they were built by men of means and prestige. Just as the Greek Revival plantation house is a symbol of antebellum Georgia, so the Neoclassical house is a symbol representing the post-Reconstruction New South. The McDougald-Beaver home is the largest and most impressive Neoclassical house remaining in Statesboro. At the time the structure was buil;t, there was only on other of such impressiveness, the J. P. Williams home. It is now the Aldred Hotel and has been bricked over, windows changed, restaurant added, and most of the Classical features removed. The large Neoclassical Donehoo home was built after the McDougald-Beaver home and was constructed of brick, as most houses in Statesboro were after the fire in 1915 destroyed the original Donehoo home. Because of its date, its design, and publicity attending its construction, the McDougald-Beaver home must be considered as an integral part of Statesboro’s early architectural history. The construction of the McDougald-Beaver home was supervised by Mr. McDougald with help of a local contractor, Benjamin H. Olliff. The architect has not been determined. . The McDougald-Beaver home is historically significant as the home of John Alexander McDougald (1864-1926), an important figure in the city’s early history. The McDougald-Beaver home is the principal property associated with the life of Mr. McDougald. John Alexander McDougald was born on June 17, 1864, in North Carolina. He died November 14, 1926, at his home in Statesboro. In 1890, McDougald moved his family from North Carolina to Statesboro and became a woodsman. Within a year he became a partner and later senior member in the turpentine still McDougald-Outland. It was with his cooperation that on the still’s timberland in 1901, Dr. Charles Holmes Herty, noted chemist, perfected the Herty Turpentine Cup that revolutionized the naval stores industry. McDougald also ran a farm North of Statesboro. Mr. McDougald served on the City Council in 1908, 1909, and 1910. He was elected Mayor of Statesboro in 1911 and ran unopposed in 1912 for a second term. During his service in city government, Mr. McDougald played a large role in establishing the Board of Education, jail, fire department, paved street, and the water, electric and sewage systems. He was also a founder of the Presbyterian Church, the Sea Island Bank and Georgia Southern College, being one the largest contributors in securing a 300 acre site for the college in 1907. Because of the dedication and generosity of men like Mr. McDougald, Statesboro prospered and grew. While Mayor, Mr. McDougald began construction of his home in 1911. The lot he chose was once part of a 700 acre farm belonging to Ben Turner. The site chosen is significant locally because Statesboro’s first legal execution took place here in 1879. Production of superior Sea Island Cotton and the coming of turpentine stills brought much wealth and growth to Statesboro in the early 1900’s. 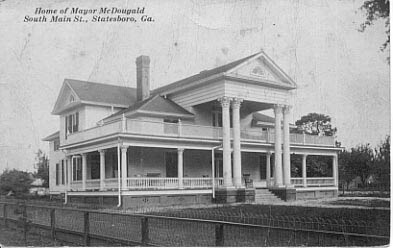 Statesboro, as the County seat, had grown from 525 in 1890, when McDougald came to Statesboro to 2,600 people in 1911 when he built his home. The McDougald-Beaver home has remained in the family since 1911. Ruth McDougald Beaver, youngest daughter of J. A. McDougald, acquired the property; at Mrs. McDougald’s death in 1941 and continued to make the property her home. Ruth and Roy Beaver had three children. The home and property remained in good repair until Mr. Beaver’s death in 1961. At Mr. Beaver’s death the children acquired the property. Over the next 18 years the home began to show signs of needed repairs and gradually shrubs and trees became overgrown to the point that the home could barely be seen from Main Street. In 1975 an artist’s rendition of the house was featured in the local paper on Halloween as the town’s haunted house with a vulture perching atop a chimney. By 1979, the children of Statesboro knew the home only as the “Haunted House”. In November 1979, John Beaver purchased his sisters’ interest in the property and is presently restoring the home. Its use will be prestige office suites, including Mr. Beaver’s Real Estate and Insurance firm. The first and second story central halls, as well as the living room dining room and kitchen will be available to the public for meetings and receptions. 1. ALEXANDER1 MCDOUGALD was born in Lived in Lergybreck, Scotland. He married CHRISTINA JOHNSTONE. 2. i. ALEXANDER2 MCDOUGALD, b. 1769; d. 1861, At age 92. 2. ALEXANDER2 MCDOUGALD (ALEXANDER1) was born 1769, and died 1861 in At age 92. He married MARGARET WIFE OF ALEXANDER MCDOUGALD. 3. i. WILLIAM ALEXANDER3 MCDOUGALD, b. March 1800, Jura, Scot, Immigrated to Charleston, SC, Nov- Dec. 1839; d. November 13, 1874, Swanns Station, Moore County, North Carolina. 4. ii. ARCHIBALD MCDOUGALD, b. 1803. 5. iii. MARY MCDOUGALD, b. 1816, Isle of Jura , Argyleshire, Scotland. iv. JOHN MCDOUGALD, b. November 29, 1831. 3. WILLIAM ALEXANDER3 MCDOUGALD (ALEXANDER2, ALEXANDER1) was born March 1800 in Jura, Scot, Immigrated to Charleston, SC, Nov- Dec. 1839, and died November 13, 1874 in Swanns Station, Moore County, North Carolina. He married CATHERINE BUIE November 29, 1831 in Jura, Scotland. 6. i. DOUGALD4 MCDOUGALD, b. July 05, 1832, Scotland, Isle of Jura, Baptised July 28, 1832; d. March 15, 1904, Statesboro, Georgia. 7. ii. DANIEL BOONE MCDOUGALD, b. May 05, 1839, Island of Jura, Scotland; d. October 14, 1902, Fayetteville, Cumberland County NC. iii. GILBERT MCDOUGALD, d. Killed in Civil War, buried at Nat. Cem. Arlington, Va..
8. iv. CATHERINE MCDOUGALD, b. 1841, Moore County, North Carolina. v. MARGARET MCDOUGALD, b. 1849, Moore County, North Carolina; m. JAMES PHILLIPS. vi. ALEXANDER MCDOUGALD, b. 1835; d. Killed in Civil War, buried at Nat. Cem. Arlington, Va..
vii. MARION MCDOUGALD, b. January 11, 1834, Baptized in Jura, January 27,1831. 9. viii. DUNCAN MCDOUGALD, b. March 15, 1837, Isle of Jura, Scotland; d. Abt. December 30, 1862. 10. ix. MALCOLM ALEXANDER MCDOUGALD, b. November 26, 1828, Isle of Jura, Scotland; d. October 13, 1909, Robeson County, North Carolina. x. MARY MCDOUGALD, b. 1846, Cumberland County North Carolina. 4. ARCHIBALD3 MCDOUGALD (ALEXANDER2, ALEXANDER1) was born 1803. He married NANCY LANNON. i. ANN4 MCDOUGALD, b. 1830.
ii. ALEXANDER MCDOUGALD, b. 1832.
iii. NEIL MCDOUGALD, b. 1834.
iv. EFFIE MCDOUGALD, b. 1837. 5. MARY3 MCDOUGALD (ALEXANDER2, ALEXANDER1) was born 1816 in Isle of Jura , Argyleshire, Scotland. She married DUNCAN MCARTAN. i. SARAH4 MCARTAN, b. 1836.
ii. JANET MCARTAN, b. 1841.
iii. 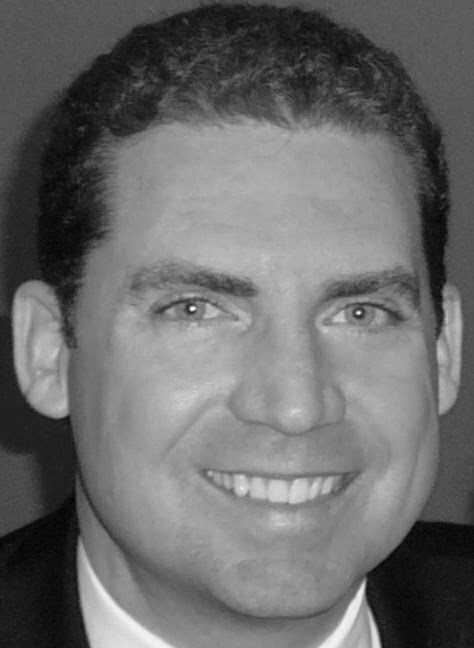 JOHN MCARTAN, b. 1843.
iv. COLIN MCARTAN, b. 1845.
v. NEIL MCARTAN, b. 1848.
vi. ALEX MCARTAN, b. 1850. 6. DOUGALD4 MCDOUGALD (WILLIAM ALEXANDER3, ALEXANDER2, ALEXANDER1) was born July 05, 1832 in Scotland, Isle of Jura, Baptised July 28, 1832, and died March 15, 1904 in Statesboro, Georgia. He married (1) SARAH ELIZABETH PHILLIPS, daughter of JEFFERSON PHILLIPS and MARY TORRENCE. He married (2) MATTIE HALL 1882 in Marlboro County SC by Rev J.M. Mott. i. WILLIAM WALTER5 MCDOUGALD, b. January 14, 1858, Coumberland County North Carolina; d. February 08, 1911, Franklinton, Louisiana, Washington Parish; m. FLORA MARTIN GRAHAM, October 16, 1879, Aberbeen, North Carolina. ii. JOHN ALEXANDER MCDOUGALD, b. June 17, 1864, Moore County, North Carolina; d. 1926, Statesboro, Georgia; m. (1) PAMELLA (MELLA) KLARP; m. (2) SARAH TORRENCE. iii. DUNCAN CAMERON MCDOUGALD, b. June 03, 1868, Cumberland County North Carolina; m. MARGARET (MAGGIE) SELLERS. iv. MARY ELIZABETH MCDOUGALD, b. March 27, 1862, Cumberland County North Carolina; m. DAVID G. BLUE, December 09, 1880.
v. ANNIE C. MCDOUGALD, b. October 19, 1870; m. COLIN SHAW. vi. MARTHA ISABELLE (MATTIE) MCDOUGALD, b. April 24, 1875, Fayetteville. North Carolina; d. August 26, 1950; m. ROBERT LEE BETHUNE. vii. MARGARET (MAGGIE) MCDOUGALD, b. December 28, 1872, Cumberland County North Carolina; m. (1) BENJAMIN DUDLEY MCLEAN; m. (2) ROBERT DRAUGHON. viii. SARAH TORRENCE (SALLIE) MCDOUGALD, b. June 02, 1866, Cumberland County North Carolina; d. April 17, 1880, Hoke County NC, buried in Galatia Cemetery, Cumberland Co.; m. L.W. WILLIAMS, MD..
ix. 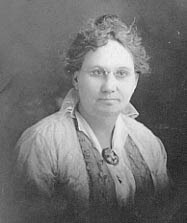 ELLEN FRANCES MCDOUGALD, b. May 26, 1859, Fayetteville. North Carolina; d. June 12, 1860, Fayetteville. North Carolina. x. CATHERINE " KATE" MCDOUGALD, b. June 12, 1860, Cumberland County North Carolina. xi. HARRIET ELEANOR5 MCDOUGALD, b. October 25, 1883, Fayetteville N.C. Cumberland Co. Christened at Old St Johns Episcopal Church. xii. LYDIE MARY MCDOUGALD, b. 1890, Sparks or Cook Co. Ga..
xiii. ROBERT HALL MCDOUGALD, b. February 02, 1886, Orangeburg District, South Carolina. 7. DANIEL BOONE4 MCDOUGALD (WILLIAM ALEXANDER3, ALEXANDER2, ALEXANDER1) was born May 05, 1839 in Island of Jura, Scotland, and died October 14, 1902 in Fayetteville, Cumberland County NC. He married CAROLINE FRANCES RUSSELL May 14, 1868.
i. WILLIAM5 MCDOUGALD, b. July 04, 1869.
ii. MARY VIRGINIA MCDOUGALD, b. May 16, 1871.
iii. DELLA KATE MCDOUGALD, b. June 27, 1873, Cumberland County North Carolina; m. GEORGE NEWELL, April 18, 1910.
iv. JOHN ALEXANDER MCDOUGALD, b. April 25, 1875; m. IDA GAINEY, July 30, 1900, Mt. Pheasant, N.C. Cumberland County. v. DANIEL EDD MCDOUGALD, b. December 11, 1876.
vi. CAROLINE "CALLIE" FRANCES MCDOUGALD, b. September 28, 1878, Lee, Moore County, North Carolina; d. February 04, 1962, Lancaster, Lancaster Co. South Carolina; m. JAMES SIMON WALDEN, April 29, 1899, Clio, South Carolina. vii. MARGARET MCDOUGALD, b. June 11, 1880.
viii. DOUGALD ARCHIE MCDOUGALD, b. September 22, 1882; d. September 01, 1961, Sanford, North Carolina. ix. MATTIE MAE MCDOUGALD, b. March 15, 1884; d. October 09, 1952; m. THOMAS J,. JONES. 8. CATHERINE4 MCDOUGALD (WILLIAM ALEXANDER3, ALEXANDER2, ALEXANDER1) was born 1841 in Moore County, North Carolina. She married MARSHALL JOHN HOLDER. 9. DUNCAN4 MCDOUGALD (WILLIAM ALEXANDER3, ALEXANDER2, ALEXANDER1) was born March 15, 1837 in Isle of Jura, Scotland, and died Abt. December 30, 1862. 10. MALCOLM ALEXANDER4 MCDOUGALD (WILLIAM ALEXANDER3, ALEXANDER2, ALEXANDER1) was born November 26, 1828 in Isle of Jura, Scotland, and died October 13, 1909 in Robeson County, North Carolina. He married CHRISTIAN CONOLEY February 01, 1855 in Richmond County, North Carolina. ii. DANIEL ARCHIBALD MCDOUGALD, b. 1856.
iii. ANNA MCDOUGALD, b. 1860.